If you play a video game online, accidentally kill your pals (virtually) and let the word out that you're female, you'll be showered with kind words. NOTE: The strip was updated since we screen-capped the female half of it. 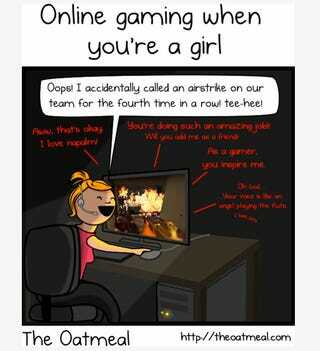 The text above the panel shown here now reads: "When a girl makes a mistake while playing an online game." The bloggers behind Fat, Ugly or Slutty, which collates some of the things female gamers hear online, believes the female part of The Oatmeal comic is inaccurate. Well there's this gamer whose mom was playing Full House Poker on their Xbox 360 and received the following unsolicited feedback: "never play poker again. Your the worst player I have ever seen ohh by the way close your legs I can smell you from here" [sic]. If only they had any other examples to strengthen their argument. When girls play, often times no one takes them seriously. If they screw up, often times the room is filled with lonely dudes who say things like "LOL that's okay! Will you marry me?" If I screw up I get eviscerated. In short: a terrible female gamer gets away with way more than a terrible male gamer (like me). He says he meant "no ill toward lady gamers." I'm thinking he still needs to chat with a few more about what it's like to play online. UPDATE: Inman has apologized "to any female famers who I offended. I didn't mean to perpetuate the idea that women are treated more nicely while playing games online. It sounds like in a lot of cases the opposite is true." He says that, having stuck with playing on Steam, he's been unaware of the verbal abuse female gamers often receive. He's donated $1,000 to the Women Against Abuse foundation for good measure.